Here's my card for the current sketch at CAS(e) this Sketch. I mixed metallics, which I don't usually do, for this festive design. My focal image is a pair of glasses made with a die from Reverse Confetti's Clink stamp set. 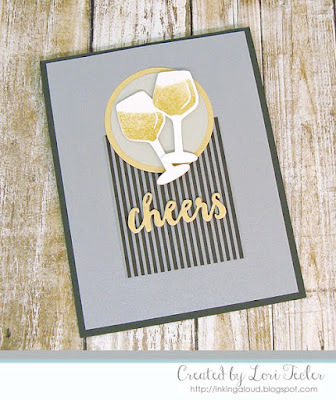 I filled in a bit of "liquid" by stamping part of the matching image on the die cut piece in shimmery gold ink. The glasses were adhered to a pale gray circle that I matted on a slightly larger gold one. The circles were adhered to the top of a gray striped panel. I positioned the panel on a silver panel, then adhered the panel to a dark gray card base. For the sentiment, I cut the word "cheers" from both gold paper and craft foam. I layered the two die cuts, then adhered the to the striped panel to finish the card. Fabulous take on the sketch, Lori!